The Team Grid Settings popup in the Manage page (entitled ‘Choose which columns you see’) has been enhanced to offer several additional features for grid columns and bar chart grouping. The Manage Page grid, the Inbox grid and the Owned Work grid have had the list of standard system attributes which you can display as grid columns including your custom data. Custom data fields which you create in Builder can now be selected as additional columns in the Manage page/Inbox/Owned Work grids. Fields of all data types can be used except for: Table fields and Long Text fields. In the Grid Settings popup of the Manage page and the Inbox page, selecting a field from the Custom Data Columns choice in the ‘Team Grid Settings’ popup. will add this field as a column in the grid. In addition to being able to see the Inbox items for your Team on the manage page, you can now switch the grid to instead show the Owned Work for your Team. 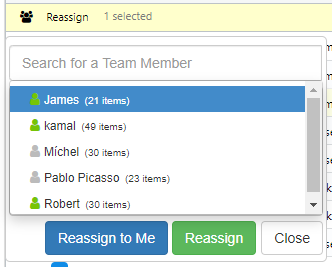 In order to help with reassignment decisions, the reassign dropdown will now display the number of work items which a potential assignee currently has in their Enate inbox. The system tracks the active enate browser session of the user, and so can check if they are still logged into Enate. Note: if the user does not log out properly, i.e. shuts the browser or machine directly without logging out of Enate, the system will display the user as still online for the duration of the standard system timeout (usually 30 minutes). An Important point is that this online/offline status is for informational purposes only – it is not considered as part of any allocation rules - i.e. the ‘Who does it go to?’ settings. Create Schedule Structures in Builder consisting of several key dates, e.g. “Submission Deadline date”, “Initial report Date”, “Credit Date” etc. 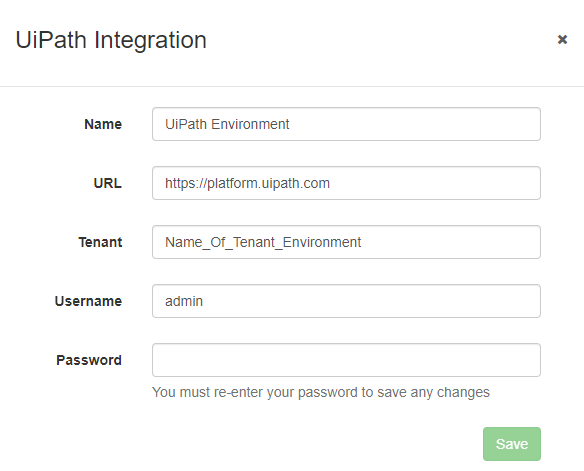 Clicking this link will bring up the UiPath Integration popup, where you can enter the relevant UiPath Orchestrator environment and login information to allow this Enate instance to talk to that Orchestrator environment. Upon setting these values and hitting Save, Enate will make a call to that UiPath Orchestrator environment and will automatically create Enate user account logins for all the Robots managed by that Orchestrator environment. Read Enate's Product Owner Kamal Saran's introduction to the release on our blog. Share your feedback at - https://feedback.enate.net. Download the full Q1 2019 release notes.